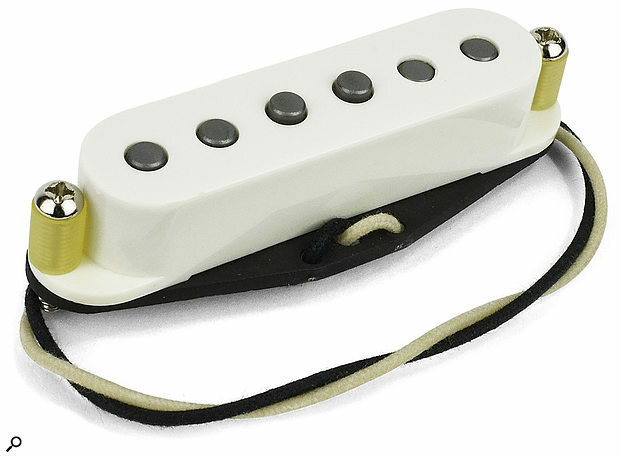 Noiseless passive single-coil-sized pickup designs have progressed enormously, from the earliest ‘stack’ models to the more complex current designs from the likes of Kinman, DiMarzio and Fender. For players who need to keep induced noise (hum) at bay whilst still using Fender-style single-coil pickup sounds, many of the current products are now far more than just the ‘acceptable compromise’ that they used to be. Mojotone’s Quiet Coil design enters the noiseless ‘single-coil’ market with two models, the ‘58, offering the tonality of a late ’50s Fender Strat pickup, and the ’67, replicating the tone of the Strat pickups of the late ‘60s. Unlike the majority of noiseless single-coil designs, these utilise side-by-side coils, rather than the commonly favoured stacked-coil configuration — effectively, they are a conventional humbucking design. Of course, single-coil-sized side-by-side humbuckers have existed for years without anyone claiming that they sounded all that much like a true single-coil pickup, so what’s different here? Quiet Coil designer David Shepherd has taken the very simple approach of using the same 42-gauge Heavy Formvar wire and Alnico magnets as a real vintage Strat pickup and configuring them as two tall, narrow coils, each with half the normal DC resistance. A series connection between the coils restores the combined DC resistance to typical single-coil values (5.8kΩ in the ‘58 model and 5.6kΩ in the ‘67 model), while a reversed winding and reversed magnetic polarity in one of the coils creates the hum-cancelling effect. The visible ‘pole pieces’, complete with ‘high-G’ vintage magnet stagger, actually don’t do anything at all; they are purely to maintain a conventional appearance. Some people may balk at this being purely cosmetic inclusion with no actual function at all but I must admit, I rather like it; Strats somehow don’t look ‘right’ without conventional pole pieces to me. I tested a ‘58 Quiet Coil set — 5.8kΩ neck and middle pickups with a 6.2kΩ bridge unit — mounted on a Mojotone pre-assembled pickguard, using the recommended 500kΩ volume pot (don’t be tempted to try to make do with your existing 250kΩ pot: 500kΩ does seem to be necessary to get the proper voicing of the pickup). Tonally, I found them to be remarkably Strat-like: crisp and articulate, but never harsh, and without the compressed dynamics that many stack designs exhibit. When you’ve experienced a lot of different pickup designs, you know when the resonant peak — the sonic signature of the pickup — is in the right place, and the Quiet Coils have very much got that right. True single-coil pickups are all about detail — the little scrapes and ringing noises that all come through loud and clear — which is what makes them both so satisfying and expressive, but also very revealing at the same time. What is so impressive about the Quiet Coils is that, up close and personal, with a clean tube amp in a quiet environment, so much of that ‘real single-coil’ detail is still there. Unsurprisingly, a really nice vintage, true single-coil still beats it for overall complexity, but by the time you are at performance levels, with some distortion involved as well, I think player and audience alike would be hard-pushed to tell the difference any more. The Quiet Coils are very good at resisting induced noise picked up by the coils — they are actually better than most full-size side-by-side humbuckers, due to the tighter proximity of the coils — but you’ll only keep out other sources of noises with a good overall screening job. I tested the Quiet Coils in a well-screened guitar and could generate no hum or buzz under any normal performance conditions. The manufacturer’s notes suggest you can adjust the Quiet Coils closer to the strings than a normal single-coil without side-effects, partly because of the lower Gauss magnets, but also because you have both polarities in close proximity, effectively both pushing and pulling the strings at the same time, rather than just pulling. There’s no dramatic tonal change when you get them up close, unlike Kinmans which offer a lot of tonal tuning by proximity, and the output level always remains comparable to a conventional single-coil, too. ‘Quieting’ a single-coil guitar has always been about choosing your compromise. Most of mine now have Illitch plates, and I just accept that there will be one angle at which they may still hum (generally solved by not standing at that angle...), and I keep a Strat with early Kinmans on it precisely because I love their squishy vintage ‘softness’ — the very characteristic that causes some people to look elsewhere. There is no ‘magic’ new design or technology here: it really is all down to the detail of the construction and material choices, but Mojotone’s Quiet Coil models are right up there with the best of the alternatives and offer a convincing single-coil tone and dynamic response with absolutely no hum. Both versions $229.95 per set or $299.95 for a loaded scratch plate.